Okoa Stima is a service that was introduced by Safaricom in attempt to reduce the disruptive nature of the prepaid electricity tokens by KPLC. It is a service that allows Safaricom and KPLC customers to avoid power disconnections without necessarily having to pay immediately. The works by enabling customers to borrow any amount within their credit limit and use the same amount to settle power bills. It basically allows you to borrow money of any amount, payment of power bills, purchase of tokens, bill querying and presentment and access to emergency power top up. This is actually a loan facility from Safaricom – serviced at 10 percent fee via Mpesa money transfer service. Users can register up to 3 meters which can then be eligible for top-ups using Okoa Stima. Okoa Stima is only available to Safaricom subscribers. Un-registered meters cannot use this facility. The loan limit is based on your historical relationship with Kenya Power. Dial *885# from a Safaricom line. Input your ID number and PIN (the PIN and a confirmation message, required to complete the registration process, are then sent by SMS to your phone. Once registered, you can then add meter numbers and borrow prepaid units by dialing *885#. Minimum loan amount is Kshs.100 and maximum loan amount is Kshs.2, 000. Repayment duration is 7 days. Loan interest is 10%. The loan disbursement mode is via M-pesa. The loan repayment mode is also via M-pesa. There is only one thing to make sure, to repay your Stima loan in time as you do not want to be blacklisted from the service. But, don’t worry about forgetting the due date; Safaricom does a good job of reminding you. Defaulters are charged a penalty of 10 percent on the advance. Okoa Stima empowers Kenya Power customers to access emergency power loans as well as query and view bills on their mobile phones. Safaricom reminds you on due date of your and hence one cannot claim on forgetting to pay the loan. Once you have repaid your loan you receive a notification message with balance if partial payment was made. If full payment was made the message informs you that the amount will be deducted from Mpesa. This helps to keep track of what has been paid and what remains unpaid. Overall it helps eliminate power disconnections at crucial moments. It is quite unfortunate that the bills paid through Okoa Stima service cannot be used on any other meter except the 3 you have registered. The payment duration is a bit short. The penalty charged on defaulters is also quite discouraging as they do not offer a chance to repay the loan incase one had unfortunate circumstances and was unable to pay on time. Poor planning or financial difficulties can result in consumers being left in the dark when their units run out. 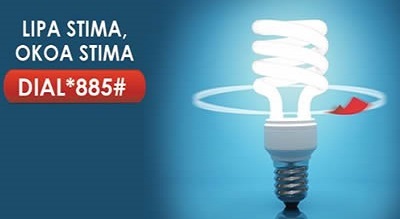 Therefore, Okoa Stima is a service that is recommendable to all the Safaricom subscribers and KPLC customers as it solves your problem of power disconnections at crucial moments.